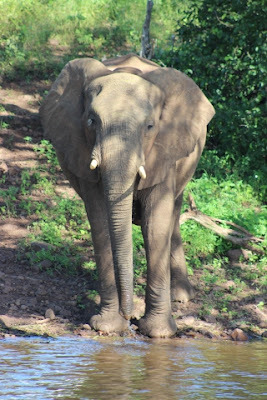 This is part two of my adventures across Southern Africa, have you read part one yet? On our first day in Botswana, after a long drive across the Zambian plains, we took a little trip on the Chobe River. Our boat sailed across the flowing water, with luscious green foliage covering each side of the banks. We had been told that this was one of the best ways to see the many animals that we hoped to meet on this trip, as they would come to the water to drink - and sure enough they did! 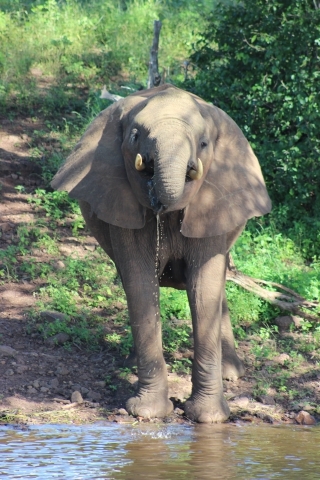 In the first twenty minutes or so, elephant after elephant ambled down to the river to drink it's cooling water. Aren't they thirsty creatures? I'm not surprised though - the sun was beating down on us all. This little beauty came for his bathe, I almost feel like I can see him smiling. Of course elephants weren't the only animals hanging around. This eagle swooped over our heads before resting in a nearby tree, surveying the scenery around him. And my personal favourite - the hungry hippo who was munching his way through the grasses! As we coasted along the water the sky began to turn pink, with a setting sun approaching. Unfortunately part of the return trip was spent huddled away from the rain, but for our hardiness we were rewarded with a stunning rainbow peeking out through the sunset. I do love silver linings. As the last light fell over the Chobe River we bid our boat driver goodbye and headed home, ready for tomorrow's adventure.